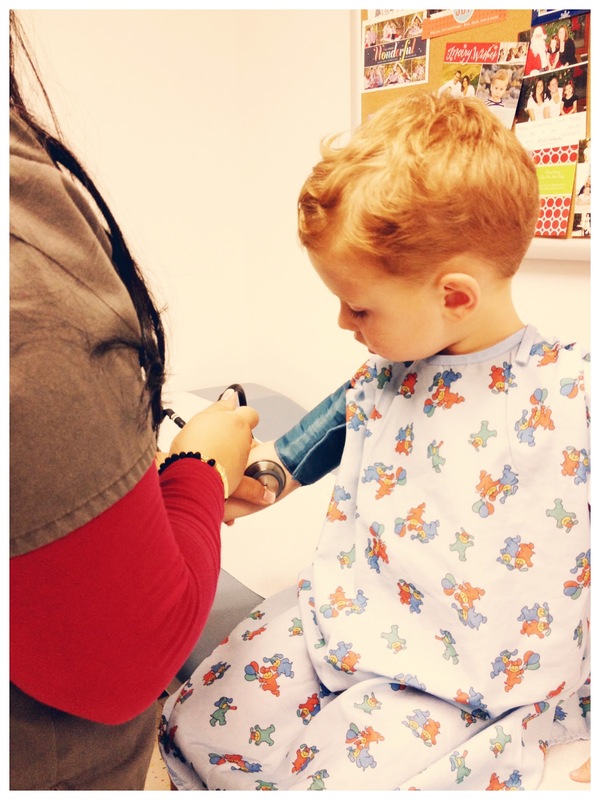 William had his three year check up yesterday with our pediatrician. I love, love, love my boys' doctor. He is the best! I like that we are a great fit with the way we feel about medical care and I feel like that compatibility doesn't come along every day. Plus, he is SO great with both boys - William actually really likes going to the doctor! I can't say enough good about him. I loved seeing Will in that little gown. It was so cute to watch his big, brown eyes get wide as they put on the blood pressure cuff. The nurse told him it was going to feel like "a little hug" and he looked at me like - what is she talking about? I was trying not to laugh. Then the doctor came in and I love how he spends a lot of time with us, plays with William for a while and sits and talks to me without making me feel rushed at all. I really appreciate that because with other doctors I felt pressured to have all my questions ready to go and sometimes forgot to ask something because I felt like they were anxious to get me out of there. He's also almost always on time with his appointments too, which is pretty remarkable when I consider how much time he spends with his patients! I think I'll stop talking about how great he is now cause it's starting to sound a little creepy. Ha! - I feel so grateful that William is healthy. Other than his cashew/pistachio allergy, we have been blessed with relatively no health issues with him or with Frederick. It is a huge blessing that I thank God for every day to have healthy, happy children.